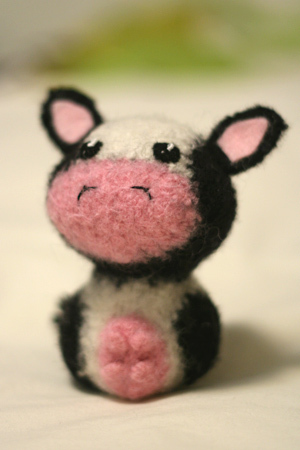 This weekend, instead of working on an ever-growing number of WIPs, I knit a little moo happiness. Kit: “Born in a Barn” Holstein Cow by Crafty Alien. Needles: Clover bamboo straights, US 10. The knitting needles and a regular sewing needle were the only things I needed besides the kit. Finished size: about 4″ tall. Not much of a back story to this one! Saw it on the Woolcott blog, had to have the one with the udder (of course), bought it the next day, and set everything aside to make a little moo cow! Bonus: the thing is small enough to warrant hand-felting, which I enjoy because you get to participate in every stage of the process. It’s adorable! Enjoy its intactness before The Beast gets to it! ACK!! how bloody cute is that?!? 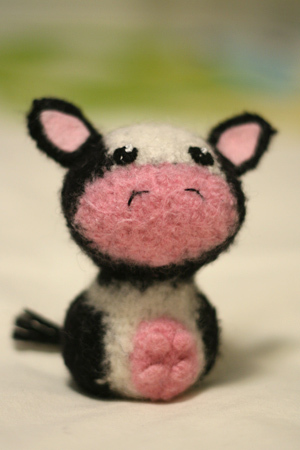 i feel weird that i totally want to knit a cow now. So cute. I might have to go to Woolcott and buy a couple of kits. how funny, I’ve been working on mine this weekend, finished the pieces earlier today and am sewing them on now. Oh my god, that is so adorable!!!!!!!! Ahhhhhhh, I might just die of cute overload. The udder makes it, truly! I think that may be the cutest cow I have ever seen. Oooh.. I’m at the same time overloaded with cuteness… and yet just looking at that with a ‘huh’ look on my face. I have a feeling some day I will knit one of those though! I. Must. Have. One. Thanks for pointing me in that direction. My god. The cuteness has latched onto my nervous system. Seizure to follow. …am I the only one who is entranced by the udders? I think the linked kitty post is one of my all time favorite blog posts; I just wish it was easier to see the polydactyl’ish’ness! Hi Kathy, Long time reader, first time commenter. That is sooo cute! I love that udder. Way to rock the macro, too! Cuteness oveload! I feel an urgent need to knit one, too. Oh, the fox! And the lobster! And and and!! I knew I shouldn’t have let the boyfriend talk me out of going to Woolcott on Sunday. I’m getting some this week. So cute! Especially the little udder! Am I the only one who’s a little disturbed, however, by the fact that the cow has no legs? So cute! So small! What a hoot! I never thought I would say this phrase… but man! That is one cute udder! I am in love. I don’t know which one I’m going to get, because I want them all. So adorable! That is total cute overload. Must have it. That is quite possibly the cutest thing I’ve ever seen. I love the little udders. love the cow! i’ve wanted to make things from crafty alien for so long, but always seem to forget when looking for a new project. I second all the comments….cute cute cute. Love that udder, I’m wondering how it looked before felting! she is so cute! i love it! I must. have. the clam! And the hedgehog is a perfect gift for my BIL! that’s too cute. i’d be too selfish to give it to the cat. Oh so very very cute! Oh my goodness, that is so cute!! omg that’s the cutest freaking thing i’ve ever seen!!!!! that is the cutest thing EVER!!!!! WARNING EXTREME CUTENESS!!!!!!!!!!!!!!! I think I finally found something my 14 yo daughter will love. OMG! That is adorable. I took a look at the rest of the kits on that website and I have to say the clam is a close second to the cow. SO CUTE! Absolutely adorable! I want one. ohmigod. too cute. i think i need one now! How to get someone to de-lurk? Post the most awful cutest!!! picture. The udder is sweet. I literally swooned when I saw the little moo moo. Great photo technique. OMG! Too cute for words. Oh god the udders crack me up. I seriously thought that it was a “praying” cow…until I realized that it was an udder. Totally funny and cute! OMG! That is completely adorable! how long did it take you to knit the cow?